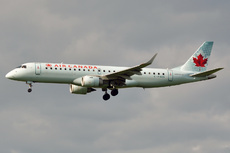 The Embraer ERJ-190-100, registration C-FHOS, operating as Air Canada flight AC361 departed Boston-Logan International Airport, Massachusetts, United States, on a regularly scheduled flight to Toronto/Lester B. Pearson International Airport, Ontario, Canada with 61 passengers, 2 cabin crew members, and 2 flight crew members on board. The captain was the pilot flying, and the first officer was the pilot monitoring. The flight reached its planned cruising altitude of flight level (FL) 360 at 16:47 and levelled off under control of the autopilot. Visual meteorological conditionswere present throughout the flight. At 16:51:13, an audible tone sounded in the cockpit, and 2 system-fault messages briefly appeared on the engine indication and crew alerting system (EICAS). Approximately 50 seconds later, an audible tone sounded again, and several more EICAS messages appeared, detailing numerous faults. At 16:52:12, the aircraft was 97 nm west-northwest of KBOS when the master warning light illuminated and the associated alarm sounded. The autopilot disconnected, 3 of the 5 cockpit display panels went dark, and several more EICAS warnings appeared, including "ELEC EMERGENCY", "IDG 1 OFF BUS", and "IDG 2 OFF BUS". These messages informed the crew that an electrical emergency had occurred and that both integrated drive generators (IDG)—the main sources of electrical power—were offline. The ram air turbine (RAT) automatically deployed within moments of the electrical failure and had restored power to the essential buses by 16:52:19. The flight crew contacted Boston air traffic control (ATC) and informed them of the electrical malfunction. Although alternate navigational guidance was still available to the crew, they had not yet selected such guidance because they were not certain of the status of the electrical system. The crew informed ATC of the lack of navigation and autopilot and requested a heading and possible altitude deviation. ATC asked if the flight crew required assistance; the crew told ATC to stand by because they were uncertain of to the severity of the problem. The crew discussed declaring an emergency but decided that they would attempt to restore main electrical power first. At this point, the aircraft was approximately 290 nm from CYYZ, or 100 nm from KBOS. The crew performed the Quick Reference Handbook (QRH) checklist for an electrical emergency. The first item on the list was to start the auxiliary power unit (APU). Because the aircraft was still at FL360, and because the published operational limitations indicate that the maximum altitude at which the APU can be started is 30 000 feet, the crew requested a descent from ATC. After starting the descent, the flight crew made an announcement to the passengers; however, unbeknownst to the flight crew, the noise generated by the RAT (because of its high rotation speed) prevented the passengers and the cabin crew from hearing the announcement. Shortly thereafter, the cabin crew communicated directly with the flight crew and were informed of the situation. The cabin crew then relayed the information to the passengers. While descending through FL300 at 16:59:37, the crew started the APU and proceeded to the next step on the checklist: resetting the IDGs. At 17:01:41, IDG 1 was brought back online, followed by IDG 2 at 17:02:04. At the same time, the aircraft was levelling off at FL240. With the IDGs back online, full power was restored to both main alternating current (AC) and both main direct current (DC) buses. With main power restored to the aircraft, the electrical emergency fault message cleared from the EICAS. The EICAS still registered a fault with the No. 2 transformer rectifier unit (TRU 2), but the systems connected to it were being powered by the No. 1 transformer rectifier unit (TRU 1). At this point, the electrical emergency was over and, although a few non-critical components were unavailable, the system as a whole was back to normal operation. The autopilot was re-engaged at 17:08:43. At 17:10, while the aircraft was approximately 170 nm from CYYZ, the crew informed Boston ATC that they had restored some electrical power but were still requesting vectors for the final approach to CYYZ. The crew requested the longest runway available because they planned to land with decreased flap. Boston ATC relayed this information to Cleveland ATC, who in turn relayed the information to Toronto ATC. All ATC units involved made accommodations to minimize delays for the aircraft for the rest of the flight. At 17:54, the aircraft landed on runway 23 at Toronto Airport without further incident. Emergency services were standing by. The crew subsequently taxied to the gate, where the passengers were deplaned. There were no injuries. 1. At some point, a fluid contaminant came into contact with the top of the right integrated control centre. It could not be determined exactly when or how it was introduced into the avionics compartment. 2. The fluid contaminant came into contact with electrical components in one of the alternating current bus bars. This caused arcing, which led to smoke and fire. The resultant failures eventually disabled the main electrical system. 3. Within 36 seconds of the initial fault, power was lost to all main bus bars and, as a result, the smoke detector in the recirculation bay and the recirculation fans lost power. 4. The smoke that had developed during this time did not travel through the recirculation ducts and onto the detector in a sufficient quantity to trigger a warning before the power supply to the detector was lost. 5. Without power, the recirculation fans did not transfer air between the middle avionics compartment and the cabin; as a result, the smoke did not enter the cabin and was not detected by the crew. 6. The flight crew followed the instructions in the Quick Reference Handbook's electrical emergency checklist and delayed resetting the integrated drive generators until the auxiliary power unit was started. As a result, the smoke detector in the recirculation bay remained unpowered during the period of time when smoke was likely detectable. 7. Due to the lack of warning of smoke or fire, the flight crew was unaware of the severity of the situation and elected to continue to destination.